I know I have been making a lot of cakes lately but this strawberry pound cake really takes the cake (pun intended). Due to the upcoming Easter holiday, my sister has come home from New York for the week. I am beyond thrilled! Because when my sister comes home it’s a free for all.. a free to stuff your face with all the food you want with no judgements and no talk of diets kinda all. So far we have been to the long horn for steaks and, of course, she had to one up me and get a steak AND lobster meal. Then the very next day we decided we needed to make a trip to Buffalo wild wings for a sandwich the size of our hands! And as if that meal wasn’t enough, we then decided we needed a slice of pie.. oh, and a coffee from Starbucks. I mean you can’t have pie without coffee, can you? Today she picked my son and I up for lunch at one of our favorite dinners, we did get a salad.. but I am not going to tell you everything else we got =p I am afraid that, unlike my sister, you will judge me. I mean I would probably judge me if I were you too, that’s a lot of food! But it doesn’t happen often, only a few times a year, so we take full advantage. And I am always sad to see her go. But I don’t want to think about that right now. Right now I want to focus on this lovely cake we will be indulging in for the next day or two, three if we’re lucky! This Strawberry Crunch Cake reminds me of a strawberry scooter crunch. It is so good! It is a moist strawberry pound cake with a cream cheese frosting and then is topped with “crunch” that is made from vanilla pudding and strawberry jello. This is the perfect summertime cake, your guests will love it! 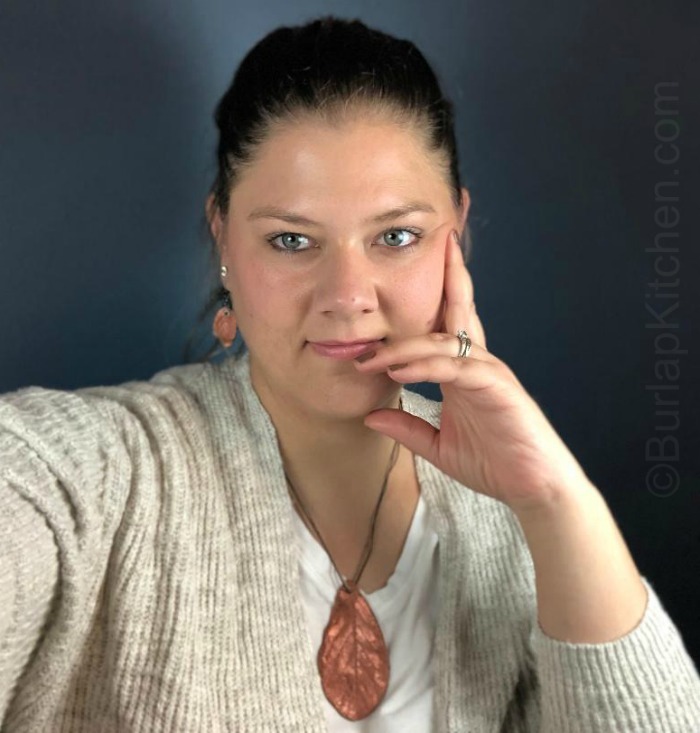 This recipe was adapted from one of the recipes I inherited from my Nana. 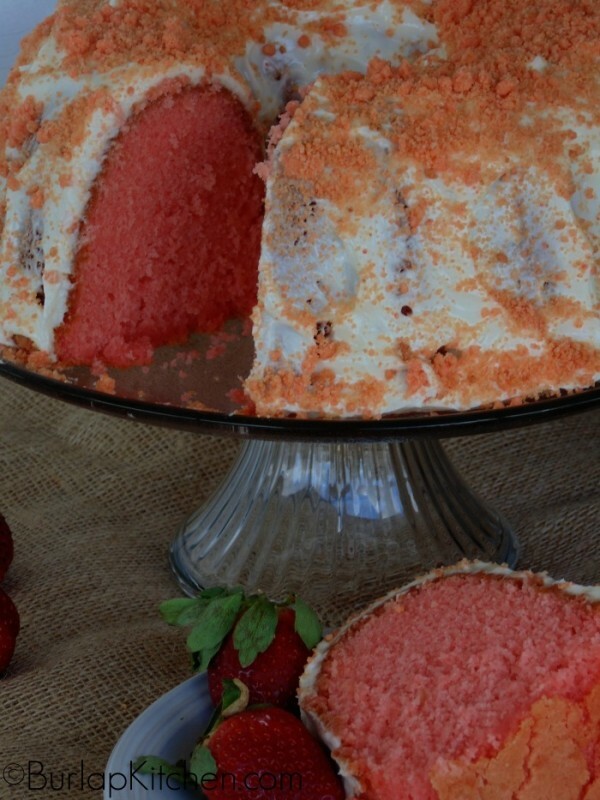 A moist strawberry pound cake that resembles the flavors of a strawberry scooter crunch. Topped with cream cheese frosting and strawberry crunchies. Preheat oven to 300 degrees ~ In a Large bowl, using a hand mixer, cream together shortening, butter, sugar, 1 package Instant Vanilla Pudding, and 1 Package Strawberry Jello ( it will look crumbly. Next mix eggs in one at a time. Add milk and mix batter till it resembles cake frosting. Next, add flour, salt, and Baking powder ( I just plop dry ingredients right on top the batter). Use a wooden spoon to slowly mix the flour in then finish it off with the hand mixer. This just keeps the flour from flying everywhere when you turn your mixer on. Pour batter into a bundt pan that has been well greased with shortening. Use a wooden spoon to smooth batter around the pan. Bake @ 300 degrees for 1(1/2) hours. Allow cake to cool for 10 - 15 minutes then carefully turn out on a clean surface to allow cake to finish cooling. Once cake is completely cool, frost it and top with strawberry crunch, recipes below. In a small bowl add 2 Tablespoons of butter, 1 (3 oz.) package of Instant Vanilla Pudding, and ONLY 1 (1/2) Teaspoons of Strawberry Jello ( Store the leftovers for a later use). Use a fork to crumb together. Bake Crumbs at 350 degrees on a greased cookie sheet for about 10 minutes, or until slightly browned, stirring every few minutes. In a small/medium bowl add cream cheese and marshmallow fluff. Use a hand mixer to mix together till fluffy. I buy a 16 oz jar of Marshmallow fluff and just use half of it.